If you have never tried watermelon salad, it will quickly become one of your favorite summertime dishes. It is incredibly refreshing and light, but packed with flavor. Having variety in the types of foods you eat is so important to health and weight loss, so don’t be afraid to try new things. This recipe, adapted from Delish.com, includes feta cheese, which can be omitted on the Genesis Health Solutions weight loss program, but is fine for the maintenance plan. There are two servings in this recipe. Serving size equals 1 serving fruit, 1 serving fat, and ½ serving of vegetable. 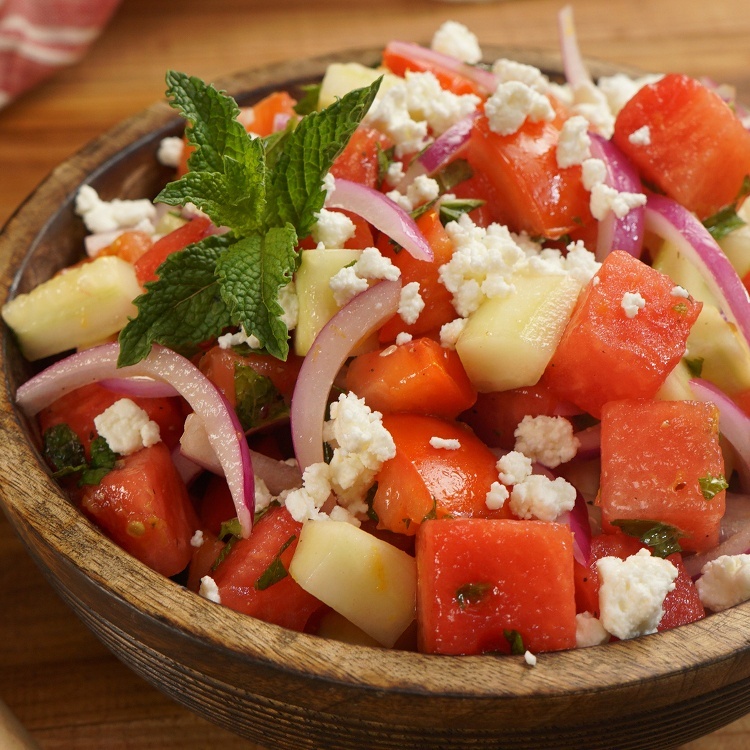 In a medium size serving bowl, combine watermelon, cucumber, onion, feta and basil/mint. In a small bowl or cup, whisk together the olive oil, red wine vinegar and sea salt. Pour dressing over watermelon and toss lightly.